You are here: Home / Can we tell black holes apart? / News / Can we tell black holes apart? One of the most fundamental predictions of Einstein’s theory of relativity is the existence of black holes. In spite of the recent detection of gravitational waves from binary black holes by LIGO, direct evidence using electromagnetic waves remains elusive and astronomers are searching for it with radio telescopes. Astrophysicists at Goethe University Frankfurt, and collaborators in the ERC-funded project BlackHoleCam in Bonn and Nijmegen have created and compared self-consistent and realistic images of the shadow of an accreting supermassive black hole – such as the black-hole candidate Sagittarius A* (Sgr A*) in the heart of our galaxy – both in general relativity and in a different theory of gravity. The goal was to test if Einsteinian black holes can be distinguished from those in alternative theories of gravity. Not all of the light rays (or photons) produced by matter falling into a black hole are trapped by the event horizon, a region of spacetime from which nothing can escape. Some of these photons will reach distant observers, so that when a black hole is observed directly a “shadow” is expected against the background sky. The size and shape of this shadow will depend on the black-hole’s properties but also on the theory of gravity. Because the largest deviations from Einstein’s theory of relativity are expected very close to the event horizon and since alternative theories of gravity make different predictions on the properties of the shadow, direct observations of Sgr A* represent a very promising approach for testing gravity in the strongest regime. Making such images of the black-hole shadow is the primary goal of the international Event Horizon Telescope Collaboration (EHTC), which combines radio data from telescopes around the world. Scientists from the BlackHoleCam team in Europe, who are part of the EHTC, have now gone a step further and investigated whether it is possible to distinguish between a “Kerr” black hole from Einstein’s gravity and a “dilaton” black hole, which is a possible solution of an alternative theory of gravity. The researchers studied the evolution of matter falling into the two very different types of black holes and calculated the radiation emitted to construct the images. Furthermore, real-life physical conditions in the telescopes and interstellar medium were used to create physically realistic images. 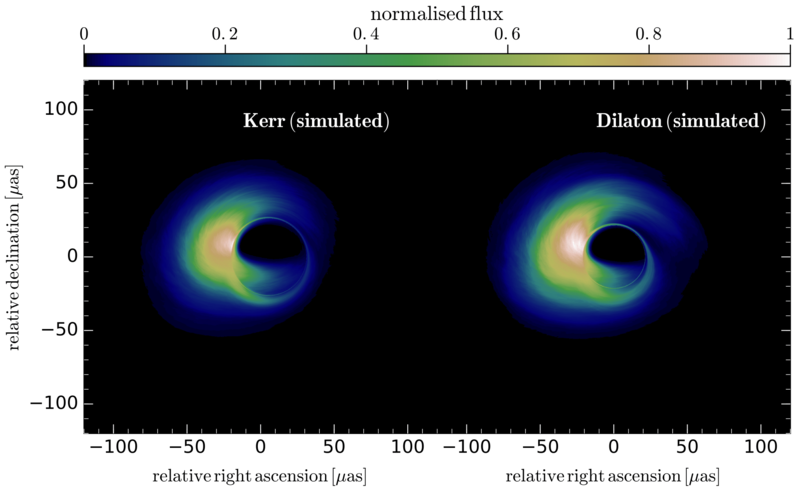 “To capture the effects of different black holes we used realistic simulations of accretion disks with near-identical initial setups. These expensive numerical simulations used state-of-the- art codes and took several months on the Institute’s supercomputer LOEWE,” says Dr. Yosuke Mizuno, lead author of the study. Astrophysicists at Goethe University Frankfurt answer this question by computing images of feeding non-Einsteinian black holes: At present it is hard to tell them apart from standard black holes. Moreover, expected radio images obviously have a limited resolution and image fidelity. When using realistic image resolutions, the scientists found, to their surprise, that even highly non- Einsteinian black holes could disguise themselves as normal black holes. 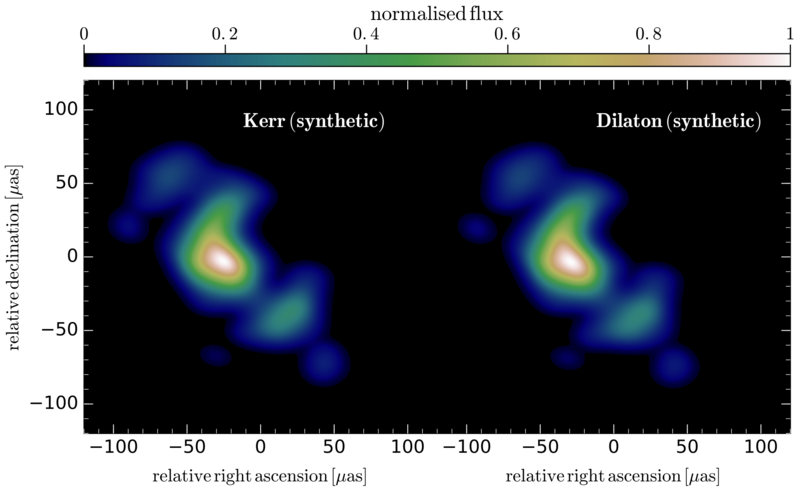 The results of this research have been published as Letter of Nature Astronomy and on the preprint archive (arXiv:180405812). Orbiting the supermassive black hole in our Milky Way (VR movie) Can we tell black holes apart?